Keita reads the game so well, how many balls has he won back for us?! Best part of this match for me. He's playing 3/4 speed maybe and still so brilliant with his touches. Extremely promising. Other highlights: Finishes from Sturridge and Wilson (and Kent), Milner's industry, Ojo's acceleration is exceptional and all Chester could do was foul him. Like to see a little more of this. Also Curtis Jones and Clyne from the 1st half. Everyone seemed healthy enough (hopefully no real issue for Danny Ings there). Just have to remind myself this was against 6th tier opposition. I suppose a little debate about Sturridge possibly staying around will begin now. Yeah As good as he has looked, you still can't rely on him , argh! That's pretty much where he operates best, in those central areas, and with Fabinho sitting, he will be even more beastly. I can't wait!!!! Good to hear of the performance from the likes of Wilson. Could he break into the first team squad this season? I’d be inclined to keep him and get rid of Ings and Sturridge to be honest. I’d say of all our youngsters, he’s more likely to break through than anyone, not including TAA obviously. Also is it me or does Wilson look a bit like Torres? Face wise, not playing wise. Pearce wrote something about Keita's debut being good and Fabinho's being not so much, but in watching these two videos showing every touch from both players, I thought they both did well. I think what Klopp was saying afterward was that Fabinho will have more adjustment to make in terms of style of play, and that the first half group didn't do as well in general, but with the exception of one overhit pass out wide, I don't see Fabinho doing anything wrong in this. In fact, he hits a number of good passes and of course nearly scored. The commentators in the highlight video I saw expressed concern over possible injuries to some of our players. Does anybody have any information on that? Probably Ings. One of the Chester players went flying in and caught Ings' ankle. Took him a while to get up, and when he was up, he looked in pain but still played until the end. Wow, Keita is going to be some player. Stephen Warnock summed him up best in his post match rundown...."The lad is a Pest". He is indeed and he is going to scare the sh*t out of a lot of teams. Him and Bobby together chasing down players and winning the ball back for us is going to be pure bliss to watch. We have a fantastic signing on our hands. Made the f**k up! Didn't see the full game as was out on a stag do. Not sure how much can be gleaned from it against a below conference side either. Anybody know when Salah and Mane expected back? I assume they are going to be involved in the US tour? Good to see that Clyney is still all involved and hasn't had a setback. We're probably not going to see TAA involved until late August so we can't have any holes in the side. Sadio and Mo report back the day before the team leaves for the U.S. Same with Marko Grujic I reckon. Trent should be back to training the first week of August. He's giving everyone three weeks for their break so that should be Aug. 4 or 5 at the latest for Jordan and Trent (and Dejan). Bobby maybe during the U.S. trip, or maybe they'll just meet him when they return to UK. We are still hunting an attacking mid type I see, so we'll see how the team looks by mid-August season opener. He's gonna boss that midfield, and maybe pick up a few yellows along the way! Seen the goals from the vid someone put up on here, tell you what though Clyne is starting to resemble Roberto Carlos's short & stocky look. Love Gini!! Such a happy fella! Could hear Virgil say that it's much tougher than he's used to. He made such an impact for us last season that I kind of forgot that this is actually going to be his first pre-season with us. 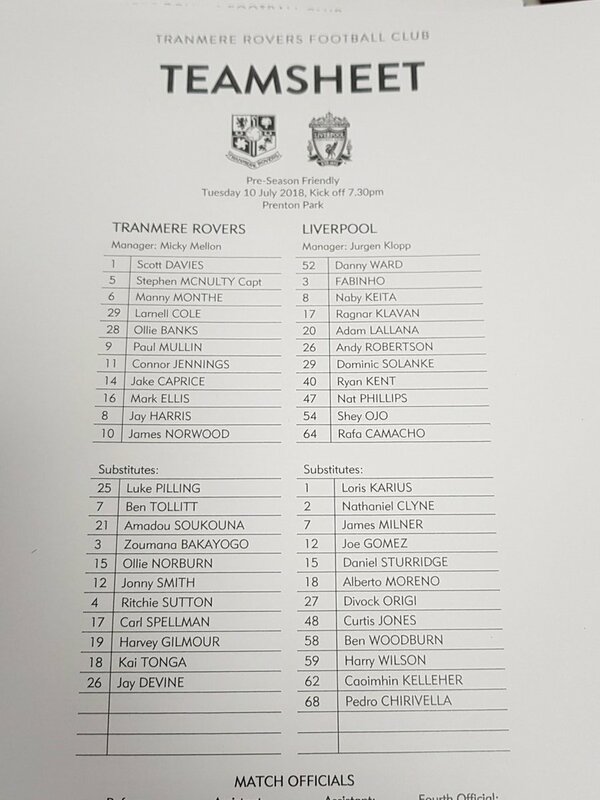 Sounds like Lallana in and maybe Ings (blisters) out for tonight's friendly at Tranmere. Virgil, Gini and Matip will play on Saturday (probably bumps Phillips, Chirivella and one midfielder from the group. Really excited for Lallana, especially if he plays in front of Keita and Chirivella/Fabinho, I reckon we would see some lovely combination play! Fabinho, Keita and Lallana the 1st half central midfield, with Ojo Kent and Solanke playing in front of them. Sturridge with Wilson and Origi up front in the 2nd half. As mentioned before, Ings is the one from Saturday missing out. If only there was a stream.